I really like the look of The Black Glove, even if I (still) don't entirely understand what it's all about. This much is clear, however: The Kickstarter is in trouble. With just four days left in the campaign, it hasn't raised even a third of its $550,000 goal, making success look unlikely. But the developers aren't giving up, and as the clock ticks down, former Irrational boss Ken Levine has taken to YouTube to officially endorse the project. 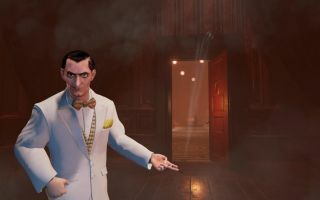 Levine's support is significant not just because he's designed a few pretty good games over the years, but because Day For Night Games, the team behind The Black Glove, is made up of veterans of the BioShock and BioShock Infinite development team. Thus, even though he hasn't actually played the game yet, he has a "huge amount of confidence" in the team and expects that the "atmosphere of the game is just going to be amazing." "We spent years working with Ken, learning how to make story rich, immersive environments like BioShock’s Rapture and BioShock Infinite’s Columbia, so it means the world to hear he believes in us and our project," Day For Night Creative Director Joe Fielder wrote in the latest Kickstarter update. Levine also suggested the developers "come up with a simple statement to boil the game down to its essence" in order to better promote it, much like David Lynch did with Twin Peaks. The result, appended to four newly-released screens, is catchy, if not exactly illuminating: "The answer must lie in the past..."
As valuable as Levine's backing may be, I can't help thinking that it would've been a whole lot more useful a month ago. It's still possible that the Kickstarter will achieve its goal and I'd love to see it happen, but with $340,000 to go in just four days, it will be nothing short of remarkable if it does.